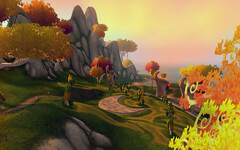 I returned from my vacation to find that the SL9B event had been running for quite a while, I quickly fired up my Second Life viewer so that I could pop in and explore. I even managed a rare blog post and (giddy from the whole experience) find myself writing another post within days (as opposed to months!) Whatever next? You see, for my vacation (or as we would say in the UK, my ‘holidays’) I went to stay at a camp by a lake in Maine. English people might think of a camp as a tent, and damp sleeping bags, stretched over bumpy ground above a subterranean sea of seething worms. In America, a camp is frequently a house with electricity and running water, a bathroom, kitchen with fridge (though we roughed it a bit without a dishwasher); we also had beds with mattresses, a washing machine, TV and DVD player plus a phone but (gasp) no internet! My favorite activity when staying ‘at the lake’ is to take out a lovely little silver rowing boat and row round to a sheltered corner of the lake that is filled with water lillies. The lilly pads and fallen trees in this area keep the speed boats and jet skies well away, freeing me to float peacefully amongst the lillies and dragonflies. 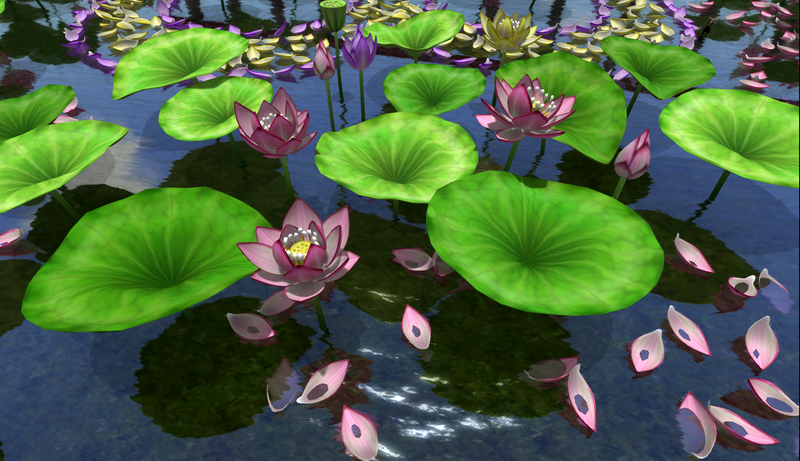 When my wanderings around SL9B brought me to the Lotus Stage with all the lotus leaves and flowers scattered at its feet I was delighted. Despite the difference that exists between lillies and lotus plants I was reminded of my rowing boat rides on the lake. 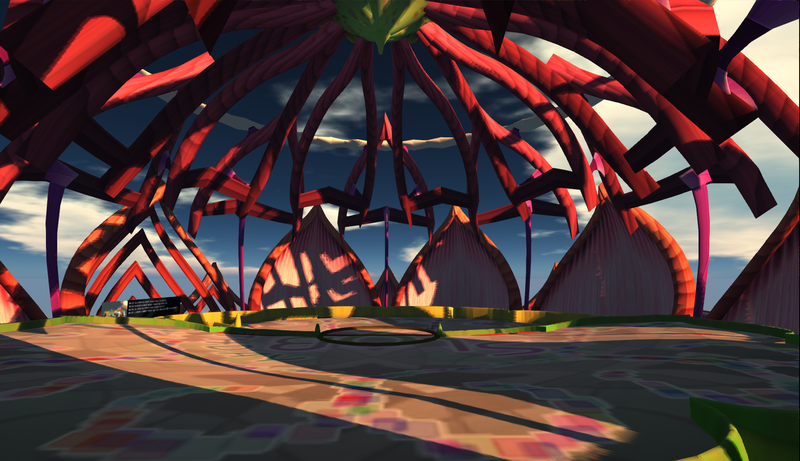 At the same time I was intrigued by the scale of everything at the Lotus Stage. 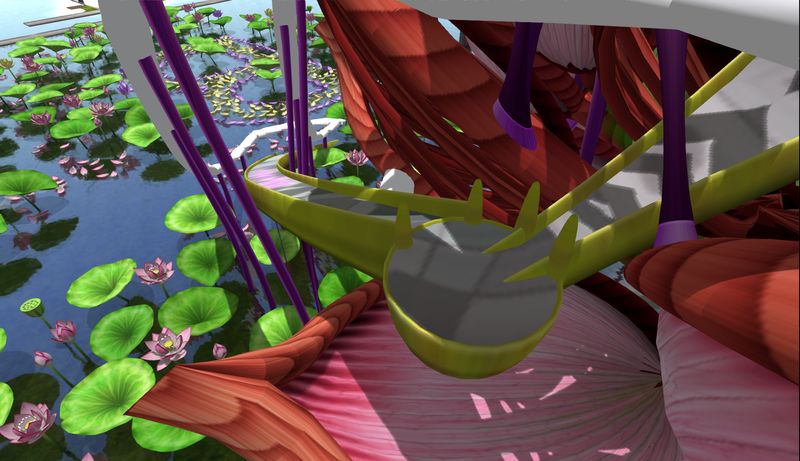 My avatar’s eye view of giant floating petals and lotus blossoms reminded me of the movie ‘Honey I Shrunk the Kids‘. The stage itself reminded me of an old theater that you might find on a Victorian seafront pier; this impression was helped by the railway bridge to nowhere that runs alongside the stage, home for a stationary steam engine and its carriages. 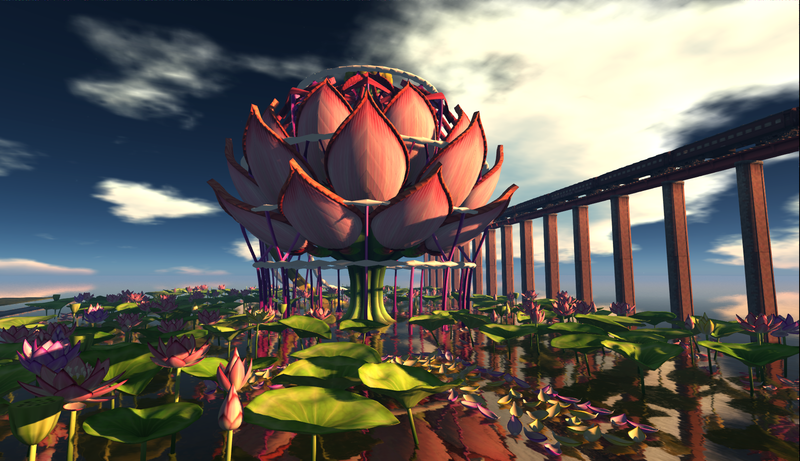 To climb up to the Lotus Stage the creator, Donpatchy Dagostino, built a long elegant ramp that spirals gently up into the petals of the giant lotus flower and opens out into the stage area. When I was wandering around on my first visit I actually arrived at the stage during a performance by the astonishing ChangHigh Trinity Dancers. Fire, lights and lasers were shooting out from the stage. The show was a striking contrast to the cool reflective waters lying below and perhaps the organizers planned it that way as a safety measure? I returned the following day to get a picture of the stage standing empty and silent in the early evening shadows. 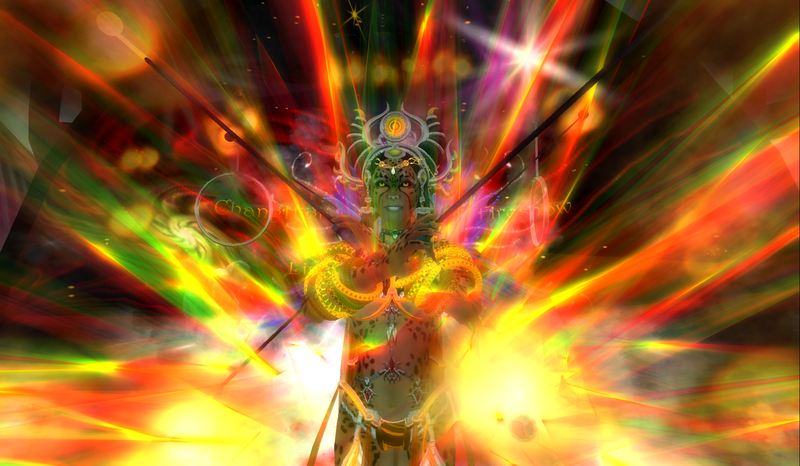 We are four spiritual sisters, from different parts of the world, who have come together and created a very unique and extremely beautiful and powerful circus/fire-dancing show in the virtual 3D world of Second Life. We perform using rotating trapezes, on high wire, podiums and on rolling balls.We fire dance on walking elephants and perform many very unique acrobatic animations, all colored by vivid radiant effects of many different kinds, scripted and available inside Second Life; such as fire balls, light particles and poofers, lasers, sparks, smokes and ofter kinds of realistic light. Finally, thanks to my ‘go to’ sources of information: Honor McMillan, Crap Mariner and Daniel Voyager Thanks for all your work in helping SL9B happen and thanks for your blogs and tweets that helped me find my way around and understand what in the virtual world was happening at SL9B!